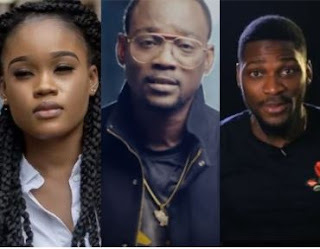 Like many other celebrities, veteran fuji musician Pasuma has weighed in on yesterday’s outburst from Ceec to Tobi in the Big Brother Naija House. According to Pasuma, ‘I haven’t been paying attention to the Nigeria’s BBNAIJA reality show until recently i started receiving its viral updates which really have been largely filled with unpalatable dramas and misconducts by some of the housemates. He continued to say, ‘this undesirable behaviour is clearly one of the indications of the collapse of our moral system and the weakness of the family unit as a vital agent of the society with the prime obligation to install values, good conduct and discipline in children from the cradle. Indeed, I’ve personally taken that as a duty as a parent. It’s always been part of my songs to the society and its expected that parents will take this responsibility with more seriousness. Though the BBN managers have penalised the erring housemate for her bad conduct, there must be stricter rules to effectively curb this unpleasant acts so as to enable viewers enjoy the real entertainment and instructional purposes of the show’.